Far out, right? Or, to quote one of the P&PC office interns, "Like, WTF, man?" Well, to help figure out W exactly TF Bunnett and Kearley might have been thinking, we solicited the help of Drew Duncan (pictured here), an award-winning teacher and professor of organic chemistry at Willamette University who took some time off from NMR spectroscopy and his favorite hobby of rock climbing to offer his own set of reactions to Bunnett and Kearley's experimental verse and the ideas of order at the intersection of poetry and O-chem. 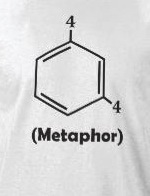 Or is that Po-chem? Either way, we think you'll enjoy what our new Periodic Consultant has to say on the matter below. Upon receiving a copy of this article, my initial response was one of astonishment. What possessed two organic chemists to undertake the project of writing an entire scientific paper in iambic pentameter? And how had they convinced journal editors (not known as a group especially welcoming to unsolicited "creativity" in issues of formatting) to let the paper be published in this form? The paper itself provides no information regarding the former query: the authors are entirely silent about their impulse to verse. A journal editor, however, does comment in a footnote written in garden-variety prose that, while "…open to new styles and formats," the editorial staff was "…surprise[ed] upon receiving this paper." An understatement, I imagine. The editor continues, "…we find the paper to be novel in its chemistry and readable in its verse." This last statement explains why the paper was permitted to be published in such an unusual format: the choice to write in verse did not detract from the clear communication of the science. (Wasn't it Ezra Pound who told poets to "Consider the way of the scientists" and argued that "Poetry should be at least as well-written as prose"?) And in reading the paper myself, I had to agree with the editor. The text provides an effective narrative of the results of the study and the authors' analysis of their data. So before I go any further, a few quick words on the science. (Don't worry, this will only hurt a bit.) 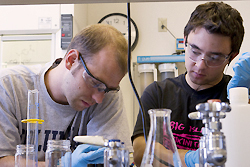 Bunnett and Kearley's study concerns a class of cyclic organic molecules called "arynes." Arynes are extraordinarily reactive: they suffer from a destabilizing condition that we in the business call "ring strain," which renders them quite unstable. In fact, arynes are so short-lived under typical laboratory conditions that they cannot be isolated or even observed. Obviously, this presents some challenges for their study. Bunnett and Kearley use one of the typical tricks that chemists employ to get around such issues: rather than study the arynes directly, they instead wait until the end of the reaction and study the ultimate, more stable products of the reaction. Based on the products observed, the authors can then make inferences regarding the identities and characteristics of the arynes that had been (briefly) present in the reaction mixture. An analogy with jellybeans might help illustrate how this works. We will use two of P&PC's ever- helpful interns for our study. Based on prior "data," you know that Intern 1 exclusively enjoys red jellybeans and Intern 2 eats only greens. 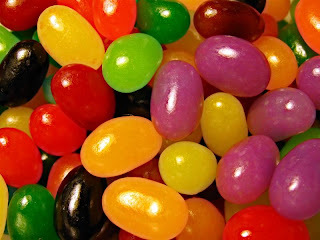 A bowl of jellybeans is placed in a locked room into which you (as the observer) have no access. At this point the "reaction" occurs, admitting either Intern 1, Intern 2, or both into the room for a period of time, during which time they eat jellybeans according to their preferences, and then leave. At this point you, as the experimenter, can access the room and assay the number and type of jellybeans that remain. If you find that the red jellybeans have been entirely consumed but all greens remain, you would infer that only Intern 1 had been in the room. If the greens are gone but the reds are uneaten, you would of course conclude the opposite: only Intern 2 was present. If some of both colors were missing, the appropriate inference would be that both Interns were present. If more reds had been consumed than greens, two possibilities exist: either Intern 1 was present longer than Intern 2, or both interns were there for the same amount of time, but Intern 1 ate faster than Intern 2. The effect of the line breaks is striking: note how the endings of the second, fourth, fifth, seventh, and eleventh lines (see underlines) suggest an imminent "reveal" ("…show clearly that"…what?! ). In each case, the effect of the line break—where the reader reflexively puts a pause—is to create a sense of tension associated with having to wait until the next line to learn the result. When reading the paper in verse form, I find myself compelled to move through the text by these small moments of drama in a way I do not experience when the text is presented in standard paragraph form. In all instances save this one, word choice throughout the paper is consistent with standard modern scientific English. And yet there sits doth in all of its archaic glory. Why? "Does" would seem to be a perfectly reasonable choice for both meaning and meter. Too much effort went into the preparation of this manuscript to consider this anything other than a deliberate choice by the authors. Is this then, perhaps, their subtle, knowing wink to their readers? An homage to Shakespeare and the poets of yore who, like these authors, chose verse as a vehicle of expression? I have no answers here, but the effect of the word is somehow rather … enchanting. Having spent some time parsing the text, I had to reconsider my initial astonished reaction to the paper’s unusual form. On one level, my reaction was easy to understand: one simply does not—doth not?—see Journal of Organic Chemistry papers written in verse every day. However, upon more sober reflection, I wondered whether my astonishment was truly warranted. 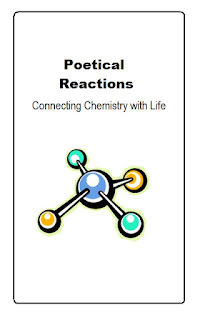 Are chemistry and poetry such strange bedfellows? 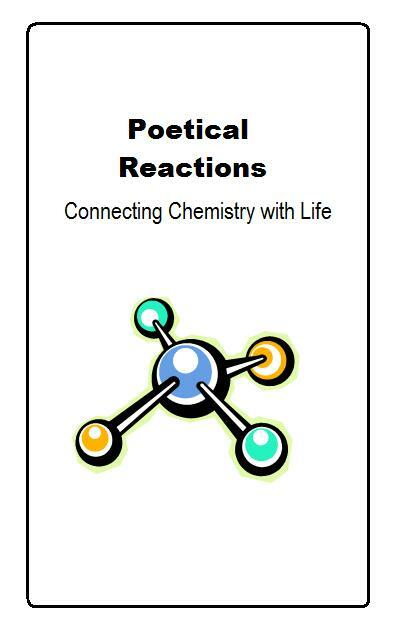 Consider that Nobel Prize-winning chemist Roald Hoffmann has published several volumes of poetry, and that each year the American Chemical Society sponsors poetry contests throughout the nation. 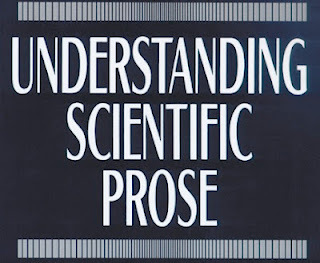 Furthermore, in a clever bit of April Foolery, the journal Nature: Chemistry announced on April 1, 2010 that there would be, "a new prerequisite for the consideration of manuscripts … [a]uthors are requested to include a short poem highlighting the novel conclusions of their work." The Nature: Chemistry staff even work in a sly homage to our JOC paper—an homage suggesting that Bunnett and Kearley's poetic efforts have not gone unappreciated in the scientific world—noting parenthetically that, "Special consideration will be given to those who prepare their entire manuscript in iambic pentameter." While this particular haiku does not, perhaps, adhere to the more nuanced characteristics of the form, it nevertheless succeeds admirably in capturing the pungent cocktail of stress, angst, resentment, and sleep deprivation in the exam room that day. 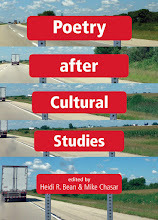 Having come to grips with the fact that chemistry and poetry can com- fortably occupy some of the same spaces, I had to ask one last question: what is it that compels chemists to make poetry a part of their scientific lives? I wonder whether it is something to do with order: a line of iambic pentameter has a prescribed number of syllables, with stresses in just the right places to maintain the meter. So too does the molecular world of the chemist rest on the idea of order, of everything in its proper place. 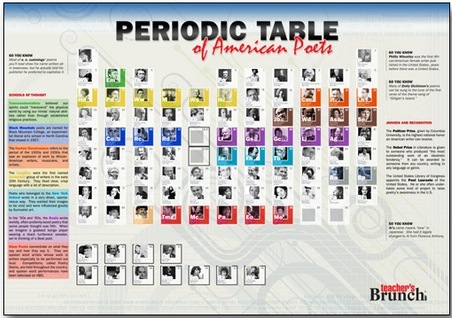 One need look no further than the foundational "text" of chemistry itself: the periodic table. Just as a haiku, whose precise arrangement of syllables and lines defines its form, so too does the ordering of elements—two in the first period, eight in the second and third periods, eighteen in the fourth and fifth periods, and so on—define the entire discipline. And in the same way that a single syllable too many or too few destroys the cadence of a line of meter, a single element out of place compromises the elegant organization of the periodic table. 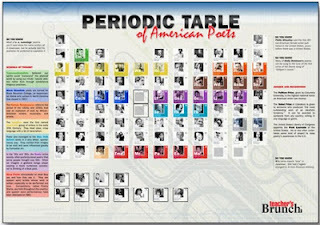 (So regular, in fact, is the "meter" of the periodic table that when scientists were confronted with "holes" in the original periodic table, they were able to predict properties of the elements that would eventually fill those holes before those elements had been discovered.) Viewed in this light, the impulse of chemists to express themselves in verse borders on self-evident: nearly every chemist has a poem of the 118 elements hanging in his or her office or lab. 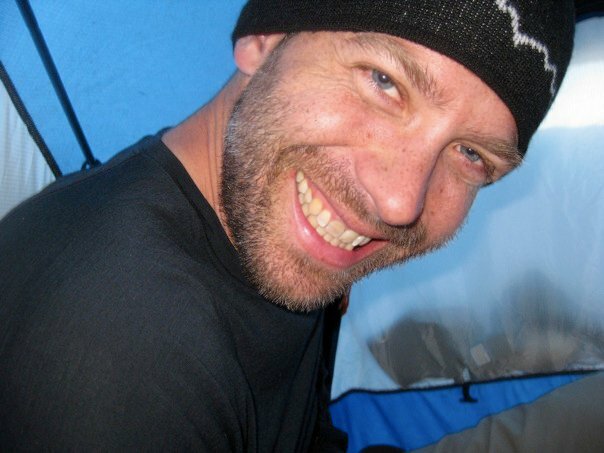 Drew Duncan is a professor of organic chemistry at Willamette University. An avid rock climber and craft beer enthusiast, he can be found at altitude, at various pubs in Portland and the Willamette Valley, or at aduncan@willamette.edu.